All pipe tobacco leaves first undergo a process called "casing" where moisture is added along with subtle amounts of sweeteners such as sugar, rum, cocoa and/or licorice. Most pipe tobacco then receives a "top" flavor which can be the essence of everything from vanilla to peach to whiskey. The more top flavor, the more aromatic the tobacco. -Shag Cut: A shredded cut, where the tobacco resembles long threads. More typically found in European brands, in both fine and very fine cuts. Best suited for hand-rolling. -Bugler Cut: This long, thin ribbon cut is the standard for most American tobacco. Shorter and less fine than a shag cut, it is ideal for both hand-rolling and tubing. -Loose cut: A long, thin ribbon cut, similar to the Bugler Cut but slightly thicker. Cutting in many different widths from and drying are the only further processes after the first steps when loose cut tobacco is made. This simple method is used for several of our finest tobaccos. -Broad Cut: The thickest cut, about twice as wide as a Loose cut. Commonly used with air-cured Virginia which is then used to blend with other cuts. -Cross Cut: A broad cut that is cut twice, creating small squares. With pressed cuts, the tobacco is placed under extreme pressure and varying degrees of heat for an extended period of time. The tobacco emerges in compressed cakes and rolls. 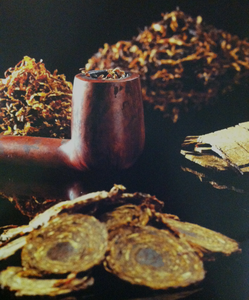 A bit of fermentation also occurs during the process, which gives the tobacco a fuller, rounder taste. Pressed cuts usually contain little or no top flavor. -Flake: Drying and storing are necessary before pressing flake tobaccos. The tobacco is placed under very high pressure at varying degrees of heat. When the tobacco cake emerges, it is sliced into thin flakes. Not only does the pressing give the flake tobacco durability and firm consistency, but also the desired taste and aroma. You fold or lightly rub the flake to put it in your pipe. -Ready Rubbed: Flake that has been created under slightly less pressure. The cutting is often more coarse than for flake tobacco. The flake is partially separated so it can be readily smoked or combined with other cuts. -Cube cut: Flake tobacco that has been cut into small cubes. -Roll Cake: Flake tobacco that is sliced more thinly than normal. The flakes are then rolled into a tight tube. Finally, they are sliced again. The result is a thin medallion. -Spun Cut: Spinning involves 3 leaves of different tobacco types. The cover leaf is often hand stripped Virginia, which must be strong and undamaged. Inside the cover leaf are two different leaves: one bright and one dark tobacco, which are also hand stripped. The leaves are placed on a table in a row, and during spinning the tobacco is twisted into a tight rope which is rolled up. The rope is then placed under compression and ultimately sliced into medallions, similar to roll cake. "Mixture" is a term often seen on pipe tobacco packages. As the name implies, it is simply a mix of different tobacco types, cuts and flavors. Many mixtures are composed from both loose cut and rubbed tobacco. They are easy to fill and smoke, and have greater robustness and taste variety than loose cut tobacco on its own. -Virginia: Often referred to as a "bright leaf tobacco", and the most widely grown variety in the world. Typically air-cured or flue-cured, Virginia is sweeter and mellower than dark leaf tobacco. Virginia is used in mixtures of cigars, pipe tobacco, rolling tobacco and cigarettes. -Cavendish: The only basic tobacco not grown in the nature. It is produced on the basis of Burley and Virginia tobaccos. Virginia tobacco is cased with a bit of rum and sugar and the sugars caramelize during the process, sweetening and darkening the tobacco. Black Cavendish is dark, yet the mildest of all basic tobaccos. Steaming and heating the tobacco at the same time, makes the tobacco ”ferment” and that makes the tobacco black, mild, round and sweet in taste. -Burley: The colour of cured Burley leaf can be light brown, reddish brown to very dark brown. It is the second most used tobacco leaf and it has a low content of natural sugar which gives it a full body taste with a touch of cocoa. The leaves have the same size as Virginia but they are narrower. Burley is used in mixtures of both cigars, pipe tobacco and cigarettes. Burley is used in many aromatic blends because it absorbs the flavorings better than other tobaccos. It is also generally higher in nicotine. -Dark Fired Kentucky: Heavy fertilizing during growth makes it a strong tobacco. The leaves are between 30-70 cm and dark brown. After air curing the curing continues over an open fire. Kentucky Dark Fired is mainly used for hand rolling tobacco and snuff. -Turkish & Oriental: Typically a sun-cured tobacco mainly grown in Turkey and Greece. When harvesting, the leaves are put on a string by hand and dried in the sun. Due to the hot, dry climate the leaves contain a high level of aromatic oils and the colour varies from green to light golden and dark orange. The leaves vary in size from 2-15 cm which is very small compared to leaves from Virginia and Burley. This highly-aromatic tobacco has more flavor than Virginia or Burley, but lower nicotine content. -Latakia: A Turkish tobacco that is first sun-cured and then fire-cured, leading to an extremely smoky flavor and aroma. This gives the tobacco a dark almost black colour and a distinctive spicy aroma, but the precise flavour depends on the particular wood used. Latakia is primarily used as a flavour in certain pipe tobacco mixtures. -Perique: A very rare sort of tobacco only produced in Louisiana, USA. It is stored in old bourbon barrels with a sauce and under high pressure. It is the strongest and most expensive of all tobaccos. -American: A mix of Virginia and Burley tobaccos. -Turkish: A mixture of Turkish/Oriental tobaccos. -Zware: Means "heavy" in Dutch and consists primarily of Dark Fired Kentucky, Latakia and air-cured Virginia. -Halfzware: Means "heavy half" in Dutch and is a combination of Virginia and Zware tobaccos. We offer a variety of Pipe Tobaccos that come in bags, canisters and tins.